Although not historically rigorously, but yes fairly speaking, the “Arnold case” was undoubtedly the one that triggered this specialized task called Ufology. Along the years there have been many and very different explanations given to the case: reflections from the ice in the mountains (Bluebook), mirages (Menzel), mistakes in the estimated distance and the size of the objects (Hynek), “earth lights” (Devereux) and…American white pelicans! (Easton & Kottmeyer). The one who approached really more to what happened was Hynek, who suggested that Arnold saw a fleet of jet aircraft. 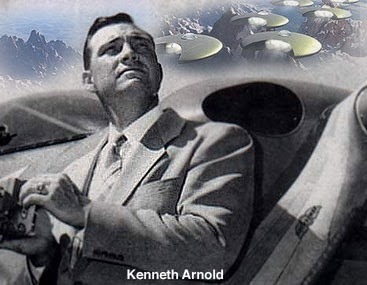 Nevertheless, the precise descriptions given by Kenneth Arnold, his belief that those objects were U.S. military aircrafts, the considerable delay of the official investigators to interview him, all of that points out to the fact that certainly Arnold saw nine brightly shining objects flying in a chain-like formation, moving in such a way that caught his attention. They were not discs or saucers in their shape, as misinformed people repeat until today. Arnold described the objects as “flat like a pan”, and from a kinetic viewpoint he said that they moved “like speedboats on a rough water”, that is a waving movement. And also Arnold said “they flew like a saucer would do if you skipped it across the water”. It was from this phrase that William C. Bequette, then a journalist working for the “East Oregonian” newspaper, in Pendleton, Oregon, coined the unfortunate term “flying saucers”. The most possible explanation is that Arnold saw a group of flying wings, very possibly Horten IX-29 jets. The other alternative would have been a group of Northrop YB-49, but these jets were not compatible with the shape of these flying wings. Enough about what Arnold saw. What comes afterwards is most interesting. “Even though I openly invited an investigation by the Army and the FBI as to the authenticity of my story or a mental or a physical examination as to my capabilities, I have received no interest from these two important protective forces of our country;…. if our Military intelligence was not aware of what I observed, they would be the very first people that I could expect as visitors”. But precisely that was not the case! This fact of being aware of what Kenneth Arnold saw, is going to be confirmed by Brigadier General John A. Samford, USAF Chief of Intelligence, in his famous press-conference given on July 29, 1952. But there was something else Samford said in that press conference. Something that the vast majority of the so-called ufologists never take into consideration, and that results in a very significant complement of what was ascertained before. This shows eloquently what I sustain in my book “OVNIs: La Agenda Seceta” (UFOs: the Secret Agenda), which is that there were a lot of intelligence and military activity that could be mistaken –or covered up—with the idea of UFOs as extra-terrestrial vehicles. And,….last but not least, a proof that the Pentagon was behind the spread of the extraterrestrial idea, is the fact that after Brigadier General Samford ended his press conference, his same place was used by the most vociferous agent of the “alien” myth: no other than USMC Major (Ret.) Donald Keyhoe!! (see https://www.youtube.com/watch?v=N_ylsFJcfUo).